I continue to be amazed at all of the fine things that I see you all turning out, whether knitted, or spun or whatever. Following that vein, I thought that I would post my own finished projects here from time to time. 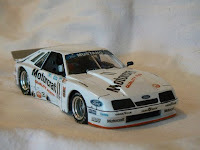 So for my first project to post, I chose this Roush Motorcraft Mustang GTO. In the 70s and 80s the International Motor Sports Association (IMSA) was one of the largest road racing sanctioning bodies in North America. There were two popular divisions, GTO, which was for vehicles with engine displacement OVER 5 liters, and GTU, which was for displacements UNDER 5 liters... Roush Racing, headed by Jack Roush has run well-organized and funded teams in a variety of venues over the years. In the 60s, the Gapp and Roush team was one of the best known teams running in NHRA drag racing. Then in the 70s and 80s, Roush ran teams in IMSA and SCCA road racing, winning championships in both venues. 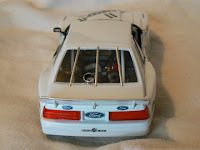 In the 90s to present day, Roush runs a very strong 5 car team in NASCAR, winning that championship more than once as well and finishing in second place for each of the last three years, twice with Carl Edwards, and once with our very own Greg Biffle, from Vancouver, Washington. 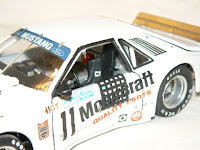 The kit that I used is the 1/25th scale Revell Motorcraft Mustang kit from the early 80s. I purchased this kit about 1992, and built everything then except for the body. 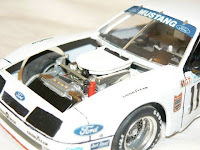 At that time, I did not feel that I had the skill to do the necessary body work that I do now, so I put it in the box and put it back on the shelf. 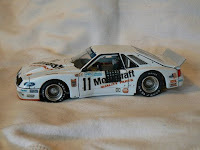 I have several models that I built then that I am now pulling out to finish so that I can display them in my collection. I pulled this kit out about Thanksgiving last year (2008) and decided that it was time to finish it. I still struggle more with body prep and work than anything else, but each one that I finish is better than the one before and I know that practice makes perfect, so I just need to keep doing it. The set included a guide to cut the strips the correct size and a different guide to lay them out correctly. The nice thing about using the tape is that I did not need to glue each place that the strips crossed over each other and once I painted it flat black it held together great, and the paint covered over the sticky part so it could be handled without sticking to everything. A different set included all of the photoetch (the process that they are made by) pieces to install the net to the car. This included all of the wires and buckles that would be on the real net. So I added them all to the net and mounted it on the model. If you biggify the photos you can see some of the small details that I was talking about. 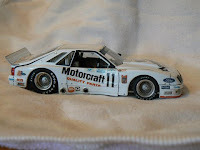 Once the body had enough time to gas out, I polished the paint to make it smooth and applied the kit decals. I discovered that one disadvantage of waiting all those years was that the decals became brittle, and some of the larger ones cracked when I attempted to use them. Very cool car! You have much more patience then I do when it comes to the detail type work. Looking forward to the next one.